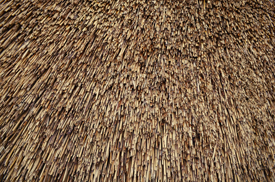 A thatched roof is always at risk from fire. Once a fire has taken hold in a thatch it will spread rapidly. Heat transfer through the brickwork of a faulty chimney or flue into the adjacent thatch. Stray sparks from chimneys, discarded cigarettes and garden bonfires. Use a bulkhead type light fitting in your loft space. Never burn rubbish or garden waste near the property. Site barbecues a safe distance away from the building. Never light fireworks near a thatched property. Television aerials on thatched buildings should be fitted to a freestanding pole. Have your brickwork, mortar and flashings regularly checked and carry out any necessary repairs. If you have a wood-burning stove or similar enclosed solid fuel burner. installed it is essential that an appropriate liner has been applied. Have your electrical system checked on a regular basis by a competent NICEIC approved electrician (as a guide every 5 years). The use of blowtorches or hot air guns should not be allowed in areas adjacent to the Thatch, particularly first floor and roof voids. Further advice is available in the thatch fire safety booklet.